Y'all really seem to be loving Crocktober this year! I've especially enjoyed getting all the pictures of the recipes you've made, as well as the great feedback! With that being said, I KNOW you're going to LOVE this Crockpot Chicken Cacciatore Recipe! To begin you will need to prep your vegetables. Next, place the chicken in the bottom of the slow cooker. Place the vegetables on top of the chicken in the crockpot. After that you will combine the marinara sauce, balsamic vinegar, garlic, diced tomatoes, Italian seasoning, brown sugar, salt, and pepper in a mixing bowl. Add about a cup of water to the marinara jar and give it a shake to get any left over sauce out of the jar and pour that into the mixing bowl as well. Now pour the sauce mixture over the chicken and vegetables in the slow cooker. Place the lid on the crockpot, set it to LOW, and cook for 6 Hours. After the 6 hours, remove the chicken from the crockpot and shred with forks. Return the shredded chicken to the crockpot. Give everything a stir and you are ready to make your pasta. 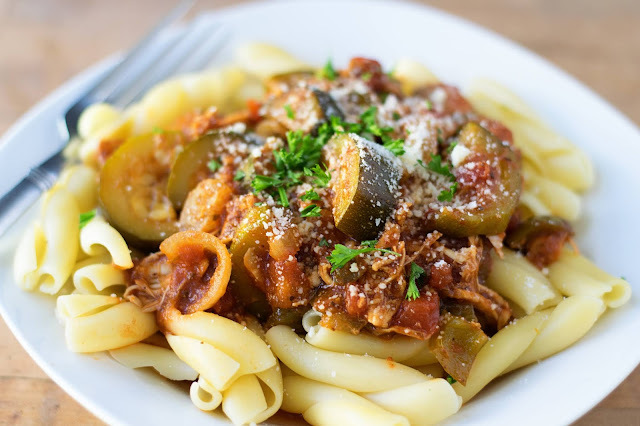 For this Crockpot Chicken Cacciatore Recipe I really like to use this gemelli pasta because I love how the sauce catches in all the grooves, but any pasta you choose will be fine. Rice or tased potatoes work well for this dish also. And there you have it! 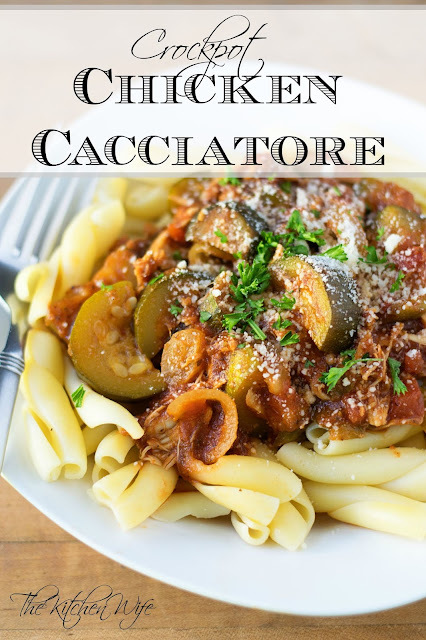 A beautiful Crockpot Chicken Cacciatore Recipe and it couldn't have been easier! I like to top mine with some fresh chopped parsley and a little grated parmesan. I know you and your family are gonna love it so get in the kitchen and make it TONIGHT! Place the vegetables on top of the chicken in the slow cooker. In a mixing bowl combine the marinara sauce, diced tomatoes, balsamic vinegar, brown sugar, garlic, Italian seasoning, salt and pepper. 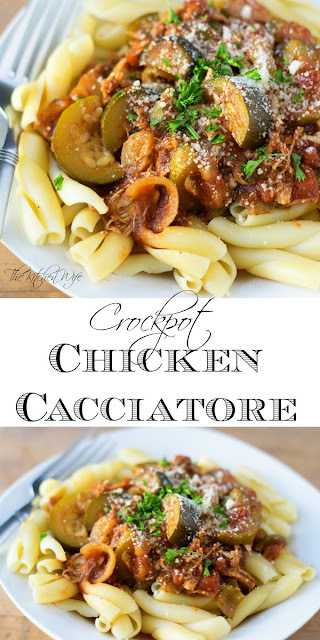 Pour the sauce over the chicken and vegetables in the crockpot. Place the lid on the crockpot, set to LOW, and cook for 6 hours. After six hours remove the chicken from the crockpot and shred. Return the chicken to the crockpot and stir.